Level it Books is the widely popular iOS app for scanning a books ISBN (bar code) and getting a Reading Level. 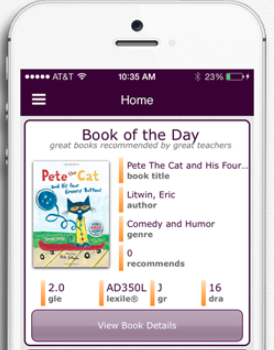 This simple to use mobile app allows educators and parents to create a digital library of their students/kids books along w/ Reading Level. Also, a educator can use it to create a digital roster of their students w/ their Reading Level assigned which makes it easier for assessing purposes. Also, a user can add or manually search for a book and find a well liked K-8 "book of the day". I highly recommend checking out Level it Books by clicking here!!! *Level it Books is an advertiser of Technology Tidbits.